Although the Music of Our Time Series has been available for many years, it is still a wealth of valuable repertoire and information. 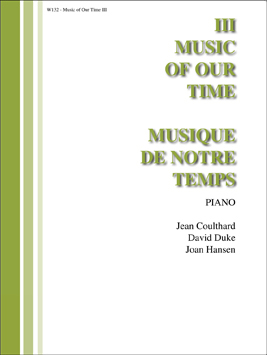 The series consists of nine volumes of piano works in contemporary styles, as well as two volumes of teachers’ guides. Music of Our Time Book 3 contains a wealth of titles including: Teeter-Totter (Hansen); On the Monkey Bars (Hansen); Smokey the Bear (Coulthard); Eskimo Song (Duke); A Cold Still Night (Coulthard); Nursery Sketch (Hansen); The Whale's Sad Story (Coulthard); Butterflies (Duke); Ecossaise (Coulthard); Penguin Parade (Hansen); The Gargoyle's Delight (Duke); Grandmother's Favourite Christmas Song (Coulthard); Sydney and Pickles (Hansen).